Showing 29 articles from December 10, 2013. Photo by Scot Pearson The landscape in South Bend is changing with the holiday season now upon us. 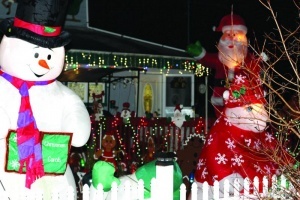 SOUTH BEND – For Bob and Doris Byrd, the holidays are made for decorating. “We have been doing this as long as we can remember. It has not always been as big, it has grown through the years, but Doris and I enjoy spending the time decorating,” said Bob. The Byrd’s decorate on most every holiday and are well into the Christmas season with their corner South Bend house. The next round of evening razor-clam digs is set to begin Saturday, Dec. 14, just in time to take home some clams for the winter holidays. 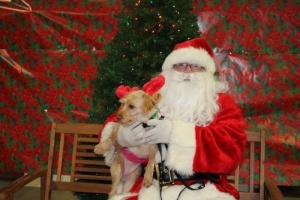 Photo by Sally Kunke This little dog, Joy, got to sit on Santa’s lap for a picture at Dennis Company Saturday afternoon. Joy belongs to Madeline Daniel of Raymond. Joy is getting a new jacket and toys for Christmas. HAVA and Dennis Company sponsored the annual Pet Pics event. SOUTH BEND – Not every community can see Santa arrive on a boat for a special pre-Christmas event. But that's going to happen in South Bend on Thursday, Dec. 12. 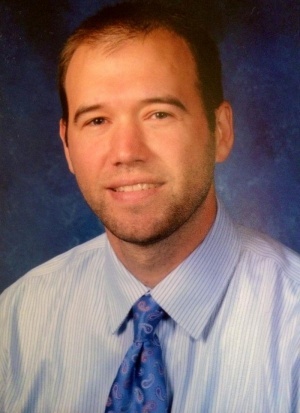 The South Bend School District board of directors has selected Naselle’s Jon Tienhaara as school superintendent to succeed retiring administrator Mike Morris. The agenda at the first December meeting of the Pacific County PUD commissioners meeting read like so many at this time of the year with voting of proposed budgets for the 2014 operating year. And after the business of current correspondence was noted and the general manager report, the commissioners got down to the business of voting on four resolutions that would approve budgets for the electrical department and three water departments. The Raymond Fire Department quickly extinguished a residential fire at 121 Ocean Ave. in Raymond at 11:46 p.m. last Thursday. Alerted by the schools alarm system, a sprinkler head looks to have malfunctioned closing the Raymond Elementary School for the day Monday. 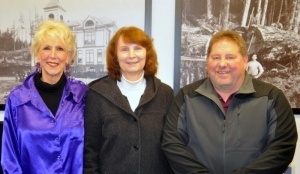 The Winlock Cleanup Committee has chosen their motto: "Cleanin’ up the Coop," with regular beatification and improvement projects expected to begin on Feb. 8. 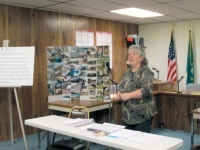 Set in motion by local businesswoman Viola Chickese, the Cleanup Committee was formed in response to the deteriorating condition of local structures, and the need for community members to pull together and take ownership of their town. Listed below are the Raymond Lighted Christmas Parade results. The City of Vader has decided to terminate a pilot program with Blue Array in light of the sewer company's inability to continue processing influent. Though Blue Array had been testing their portable treatment system in Vader since the beginning of the year, power to their prototype was disconnected Dec. 1 after they failed to keep up with electric bills, leaving them unable to treat the sewage entering Vader's plant. The Vader City Council has approved a resolution supporting a transfer agreement giving their water system to Lewis County, with an opportunity for the city to reacquire the system within 10 years. The management of Vader's system had been given to Lewis County by a court order in early 2010 in light of significant leaks in the system, which Vader could not afford to repair at the time. Notes: Home games are in bold. Varsity games start at approximately 7:15. * Denotes Pacific 2B League Game. Karli Friese was hotter than a pistol while firing in 27 points during Willapa Valley’s 70-55 home victory over Tacoma Baptist Friday night. Friese targeted 11 of 16 of her shots, handed out 7 assists, tore down 7 boards and stole the ball 5 times. 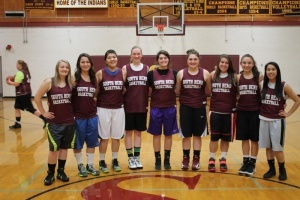 Photo by George Kunke Lady Indians, Coaches: Gary Wilson, Alyssa Caudill, Theresa Mott; Players: Katlyn Sawyer, Baylee Trent, Sierra Cearns, Rielly Myers, Emma Lorton, Edith Razo, Emily Sanchez, Kessa Wilson, Tammi Kousonhsavath. 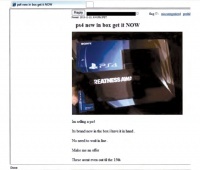 Weaknesses: Not sustaining strong level of play for the entire game. Captain(s): Rotate Players every game. League forecast: I think Willapa Valley has the edge for now. Assistant coaches: Alyssa Caudill, Theresa Mott. Weaknesses: We are a young and fairly inexperienced team. Goals: Our goal is to improve each game and become a better team as the season progresses. Also to become more fundamentally sound in our skills, and play to the best of our ability each game. Strengths: For the first time in many Viking years, we have a good mix of speed and height. Weaknesses: We need to improve our free throw shooting and eliminate scoring droughts. Leaders: The coaching staff is stressing, “playing as a team,” and accepting their roles for the good of the team. Captain(s): Will change each week. Notes:Home games are in bold. JV games start at 5:45 with varsity to follow. 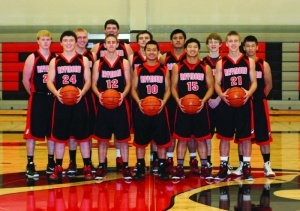 * denotes Pacific League game; # Homecomng; % Senior Night; $ - at Spokane. 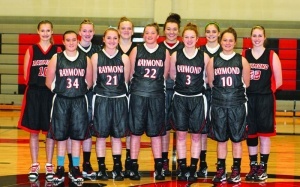 Goals: Rebound well, play good defense, share the ball, and play harder than anyone we play. Finish in the top half of our league. Weaknesses: Not a lot of depth and perimeter shooting. Leaders: Our seniors are doing a nice job so far. League forecast: The league is as good as I have seen it in a while. Raymond is the clear favorite. 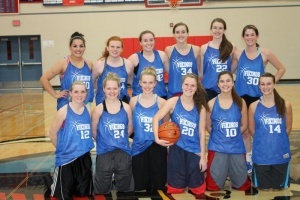 They are very athletic and will be well coached. North Beach is scary because of their athleticism and they play so hard. Northwest Christian-Lacey is improved, as is Ocosta. 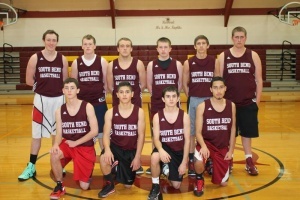 South Bend is a team that worries me because they are a year more experienced and are well coached. Photo by George Kunke Vikings Varsity, Head Coach John Peterson; Players: Anthony Sagen, Cody Buchanan, Matt Konigsberger, Trevor Cook, Kyler Oblad, Hunter Gray, Jason Fluke, Drew Pearson, Stephen Camenzind; Junior Varsity, Coaches: Jay Pearson, Jim Noren; Players: Robert Espina, Cameron McAllister, Trevor Cook, Chase Flemetis, Hunter Gray, Jason Fluke, Leonel Ruelas, Trevor Ritzman, Damian Redding, Brendyn Graves, Matt Minton; C-Squad, Coaches: Jay Pearson, Jim Noren; Players: Abraham Moreno, Michael Brown, Frankie Arellano, Lukas King, Leonel Ruelas, Matt Minton, Josh Bowe. 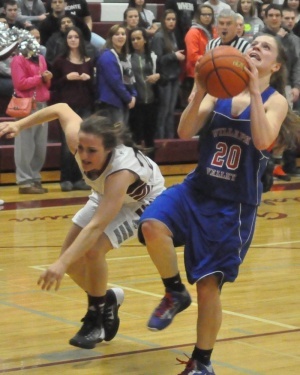 Willapa Valley opened the cage season with a big road win at Napavine, defeating the Tigers 55-49 last Wednesday. 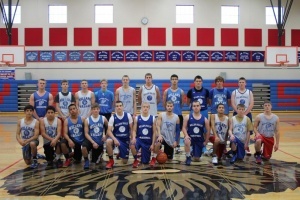 Kyler Oblad fired in 14 points and Matt Konigsberger popped in 13, took down 11 rebounds and handed out 4 assists. 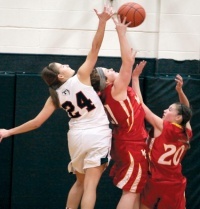 The Winlock/Toledo sports rivalry may not be what it used to be, but don't tell that to any of the basketball girls on the George Murdock floor Wednesday night at Toledo High School during the only athletic meeting of the two schools this school year. The Winlock girls came out focused, reeling off 13 and then 18 points in the first and second quarters respectively behind pin-point shooting during a 50-39 non-league game on Wednesday. When the lady Cardinals didn't have the ball, they were making life miserable for Toledo with a harassing ninety feet of defense. A Winlock man has been arrested for stealing an estimated $100,000 worth of electronics from UPS over the last four months, and appeared in court on 18 felony charges Dec. 3. Roland E. Camps, 40, was taken into custody Dec. 2 following an investigation into shipments of cell phones, video games and other electronics stolen since Aug. 9, according to the Lewis County Sheriff’s Office. Winlock has added a new officer to its police department, who has begun patrolling the city after being confirmed by the City Council Nov. 25. 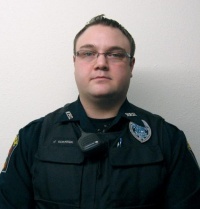 Officer Joshua Goffena was hired to fill a vacant full-time officer’s position left open since September and joins Winlock after serving in Anchorage, Alaska, for the last four years. How is the North Poles. I want fo Krismis a kendle and iprd and dsi and exbox.